Kiev (AFP) - A two-day-old truce in Ukraine was at risk of collapsing Monday as fighting raged around a strategic railway hub and both sides said conditions were not met to start withdrawing heavy weapons from the frontline. The European Union, which backed the French- and German-mediated truce eked out last week, pleaded that "the shooting needs to stop". The bloc also imposed fresh sanctions on Russia, which it accuses of militarily backing the pro-Russian rebels fighting Ukraine's government troops. Russia, which denies involvement in the conflict, vowed an "appropriate response" to the EU move. Kiev officials and rebels accused each other of ongoing attacks that prevented them from pulling back tanks, rockets and artillery from the frontline in Ukraine's east. The United States called on Russia and the separatists to "immediately" halt attacks in eastern Ukraine, expressing grave concern about the "deteriorating situation". The withdrawal of heavy weapons was meant to begin Monday, at midnight (2200 GMT) by the latest, under the terms of the ceasefire. But a senior Ukrainian government source told AFP there had been no such withdrawal by the deadline. "The withdrawal could start on Tuesday if the necessary conditions are met," the source said on condition of anonymity. 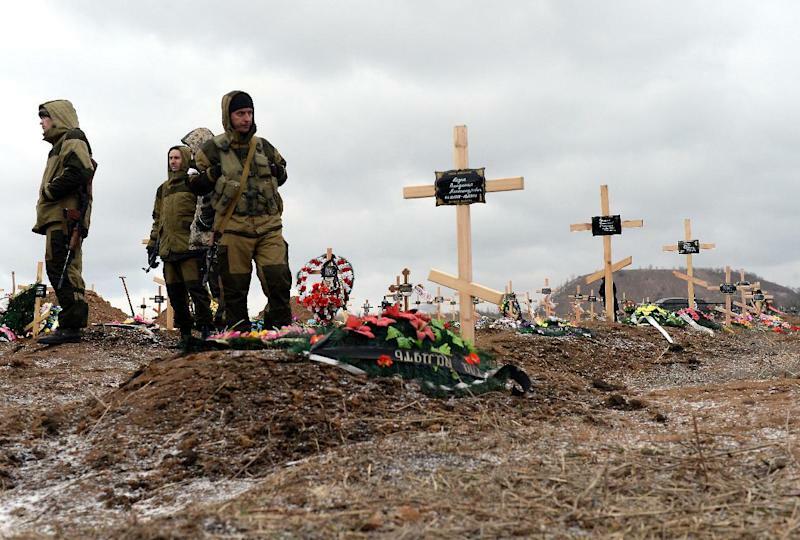 The worst of the violence was around the town of Debaltseve, a key transport hub between the separatist-held cities of Donetsk and Lugansk, where thousands of government troops were mostly surrounded by heavily armed rebels. The confrontation there was "intensifying" late Monday, a deputy police chief in the Kiev-controlled part of the region, Ilya Kiva, told Ukrainian television's Channel 5. "Fighting is under way. There is mortar shelling, attacks with howitzers and Grad missile launchers of the centre of Debaltseve," he said. Natalia Karabuta, a municipal official who fled the town, told AFP explosions were occurring "non-stop". She estimated 5,000 civilians were trapped there with little food and water. 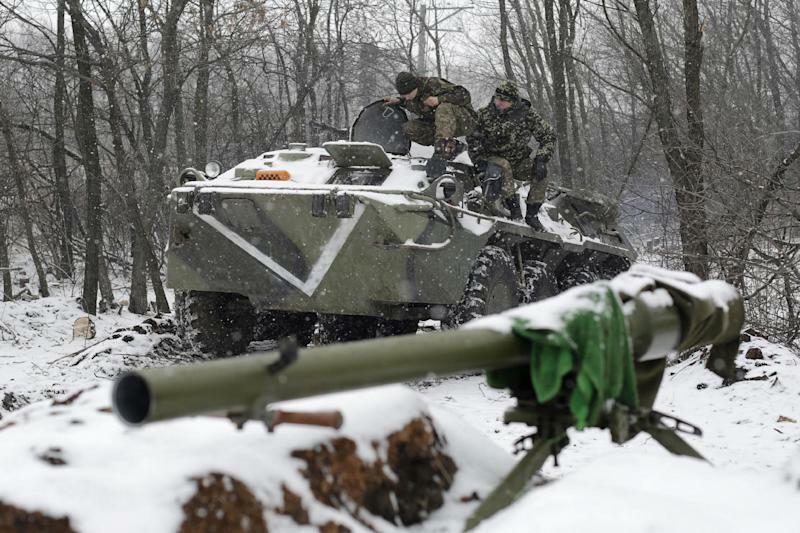 An Organization for Security and Cooperation in Europe (OSCE) team tasked with monitoring the ceasefire has been unable to enter Debaltseve because of the fighting. A Ukrainian military spokesman, Vladyslav Seleznyov, said "there is no question at the moment of us withdrawing heavy weapons" from the frontline because of rebel attacks. The rebels also rejected pulling back any heavy weapons on their side until a "full" ceasefire was in effect. Both sides accused the other of renewing attacks in some other areas, including at rebel-held Donetsk airport and near the port city of Mariupol. Ukraine's government said the rebels had launched more than 112 assaults on its troops' positions on Sunday, killing five soldiers and wounding 25. Monday saw another 38 attacks, most of them by Grad multiple rocket launchers and mortars, the defence ministry said on its Facebook page. It claimed the separatists themselves had fired on Donetsk to blame the attack on government forces. European Commission spokeswoman Maja Kocijancic said that while the truce was seen as "largely" holding, "it is imperative the ceasefire is fully implemented... it means the shooting needs to stop". German Chancellor Angela Merkel echoed that call while admitting "the situation is fragile". "I always said that there was no guarantee that we would succeed in our efforts. It is an extremely difficult path," she said. Merkel, French President Francois Hollande and Ukrainian President Petro Poroshenko spoke by telephone late Monday and expressed concern at the continued fighting around Debaltseve. The leaders called for the OSCE monitors to have "free access". The ultimate aim of the peace plan is to end the 10-month-old conflict that has killed more than 5,600 people, according to the UN. A previous ceasefire agreed in September stalled within days and eventually disintegrated. Europe and the US have dismissed Russian President Vladimir Putin's denials of having a hand in Ukraine's eastern insurrection. They have noted that he made similar protestations over Ukraine's Crimea peninsula before finally admitting he had ordered in Russian troops there ahead of annexing the territory last year. On Monday, the EU added five Russians to its travel-ban and asset-freeze blacklist: two deputy defence ministers, two lawmakers and another citizen. 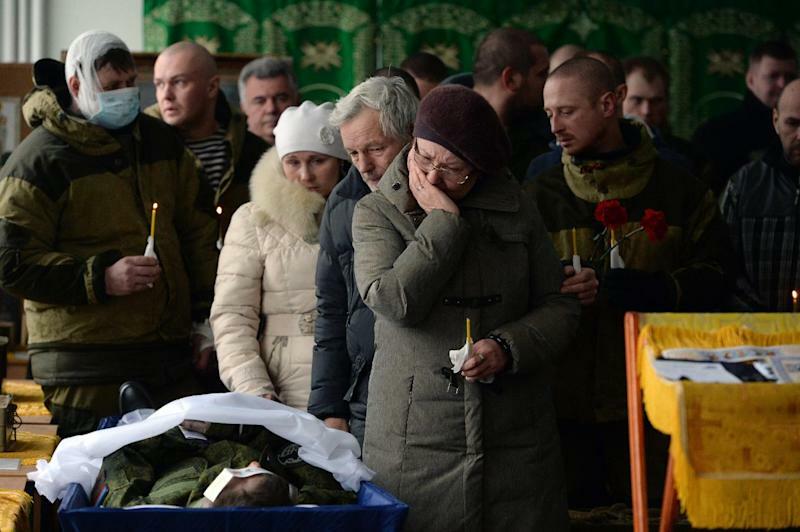 Fourteen Ukrainian rebel military or political figures were also blacklisted, along with nine organisations. Russia's foreign ministry lashed out at the latest EU sanctions as "inconsistent and illogical". "Such decisions... will be followed by an appropriate response," it warned in a statement. Russia has already banned European food imports in retaliation for previous sanctions.